At the start of summer, I was on an early morning hike near Burma Road Trail in the Portuguese Bend Nature Reserve when I looked up in the trees and saw two of the biggest yellow eyes I’d ever seen staring right back at me. We sat there for what felt like 10 minutes just looking curiously at one another. It was a moment I will remember for a long time and one that inspired a summer dedicated to photographing this Great Horned Owls family. Aside from their piercing yellow eyes, one of the first things you’ll notice when looking at these magnificent owls is their “horns,” which are actually tufts of feathers. Scientists are divided over their purpose. Another striking feature is their elegant feather pattern. Also known as the “tiger owl” their brown and white feathers help them camouflage themselves in the trees. Their feathers also enable them to fly silently. Over the past few months I have been lucky enough to track down where the owls nest and the locations they frequent. They were surprisingly calm in my presence and seemed indifferent to me taking their picture, often times dozing off or calling to one another. Most of the time I would find them by their calls. 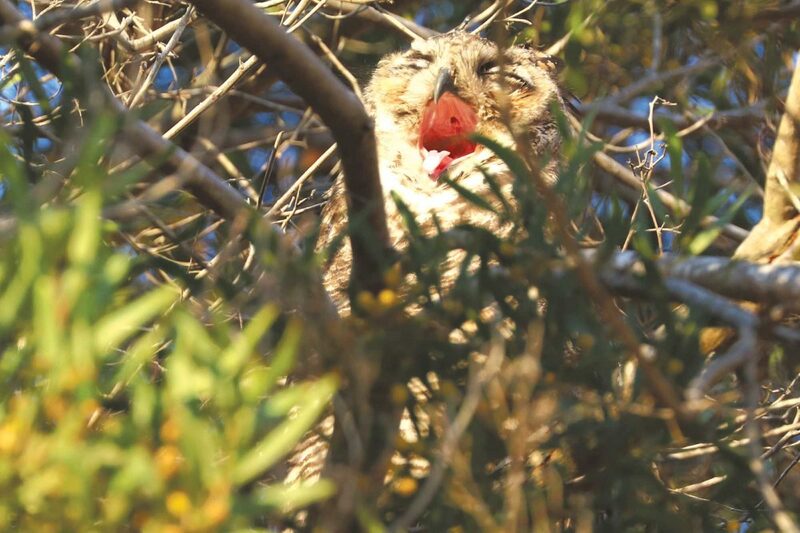 The males owls makes the classic “hoo hoo,”, while the females make a loud, screeching sound. The largest group I saw was a male and two females. I learned that when in a group the correct term is “a parliament of owls” because they are considered to be wise creatures. In Greek mythology the symbol for Athena, the goddess of wisdom, is an owl. These wise creatures brought two new owls into the world a few months back and I was lucky enough to see them with their mother. The babies have a much lighter feather pattern and weren’t adept at flying until they were 10 to 12 weeks old. Because of this they were dependent on their parents for food. 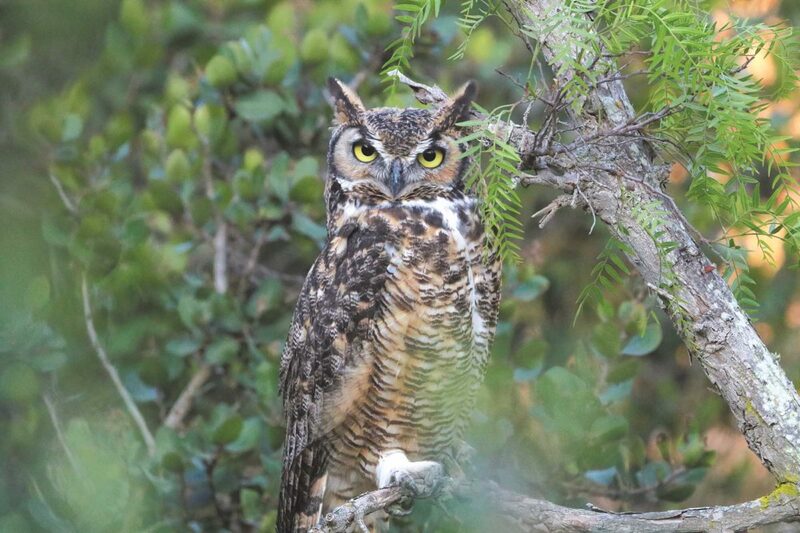 The Great Horned Owls are well adapted to the reserve and are known to hunt for hares, rodents, and even small birds and reptiles. I was never lucky enough to see this behavior. However I did find owl pellets filled with bones that appeared to be from small rodents. The best time to see the owls is just after sunrise or just before sunset. To find them I would park on Forestall Drive, across from the Lower Ladera fields. The quickest way from there is to take the street down to Panorama Trail. 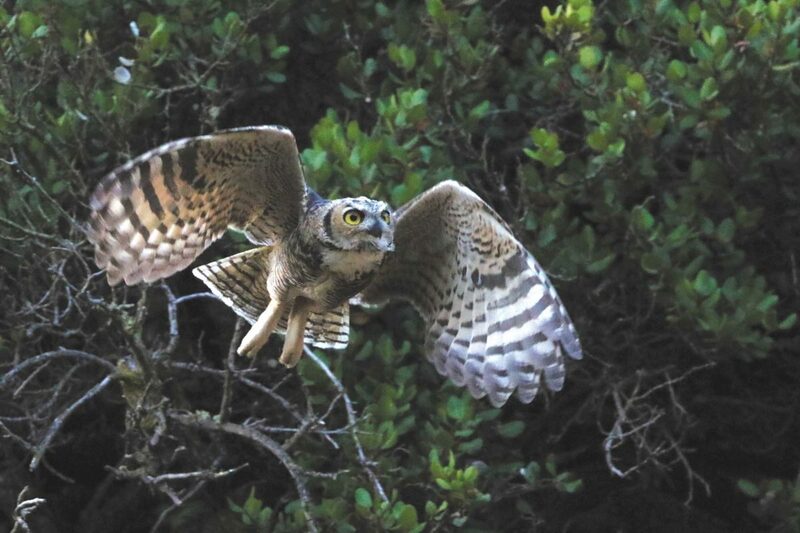 The owls can be seen or more likely heard in the trees in the valley by the Ishibashi Farm Trail, leading up to the Landslide Scarp Trail. 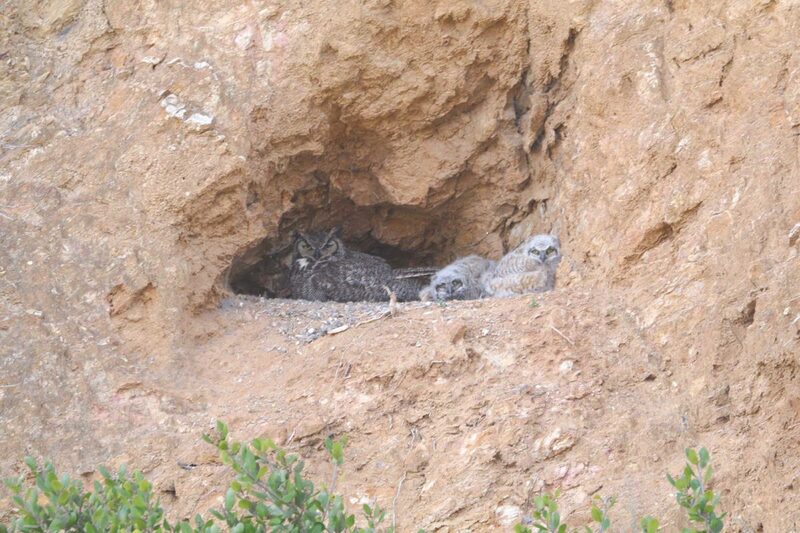 The owls can also be seen on the cliff sides. If they are awake you may catch them bobbing their head back and forth at you in what looks like a goofy owl dance. 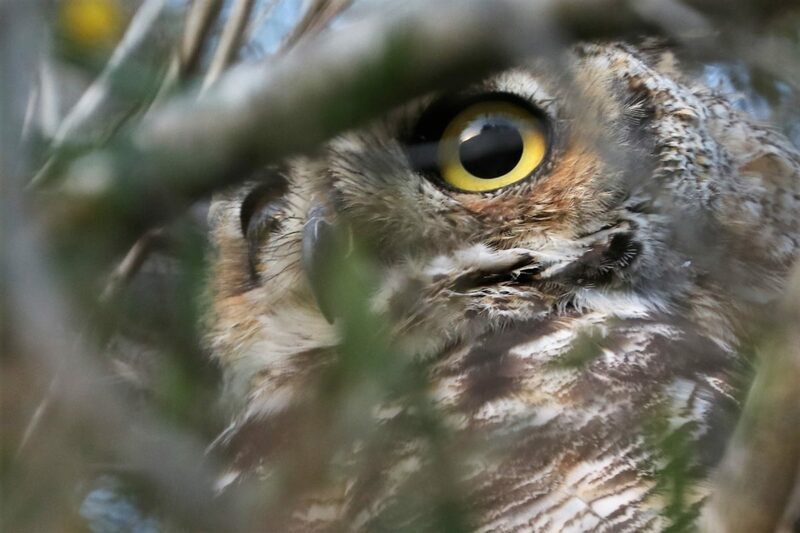 This behavior helps the owls get a three dimensional picture of what they are looking at. I was raised in Palos Verdes and have spent a lot of time on these trails looking for fossils and crystals and enjoying the view of Catalina Island. But I am 25 and only recently got to see these striking birds. They are a reminder of the importance of preservation and of the beauty of nature. As the two baby owls grow, I hope too, our appreciation for these birds and the reserve they call home will grow.